The Tooling API provides powerful new ways to manage your code and get further insight into how its structured. This session will teach you how to use the Tooling API and its Symbol Table to analyse your code using an application integrated via Force.com Canvas directly into your Salesforce org — no command line or desktop install required! Join us and take your knowledge of how your Apex code is really structured to the next level! As I hinted at in the last blog I was not 100% happy with the Mind Map visualisation I initially used. It was fun to play with, but I wanted to illustrate the use of the Tooling API with something more functional. So I went searching for a new library. I wanted something that was HML5 based, that would dynamically render as the user selected Apex classes. I’ll eventually share this as a package once I’ve had a chance to work on it a bit more (it’s currently showing only UML Dependency relationships). In the meantime please take a look at the new video below and join me in my Dreamforce Session to hear about how I built it! 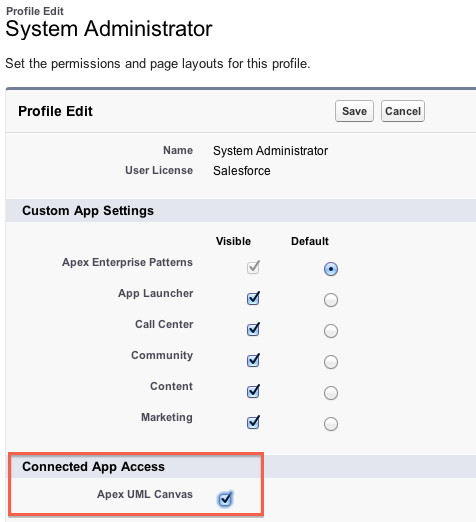 Categories: Apex, Canvas, Dreamforce, Tooling API | Permalink. 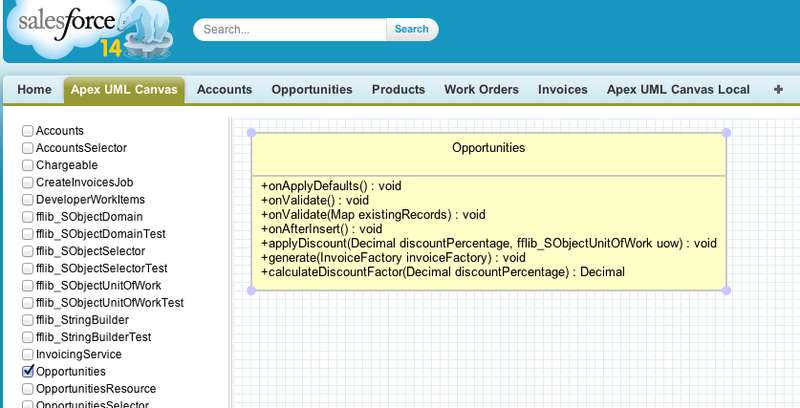 This weekend I’ve been fleshing out the code for my second Dreamforce 2013 session. I’ve been having a lot of fun with various technologies to create the following demo which I’ve shared a short work in progress video below. The JQuery plugin doing the rendering is js-mindmap, it’s got some quirks I’ve discovered so far, but I’m sticky with it for now! I’ve also found the excellent ObjectAid Eclipse plugin (which is sadly a Java source code only tool) to explore the Tooling API data structures in much more detail than the Salesforce documentation currently offers, especially in respect to the SymbolTable structure. I’ll be sharing full code and discussing the following diagram in more detail in my session! In the meantime I’d love to know your thoughts and other ideas around the Tooling API! 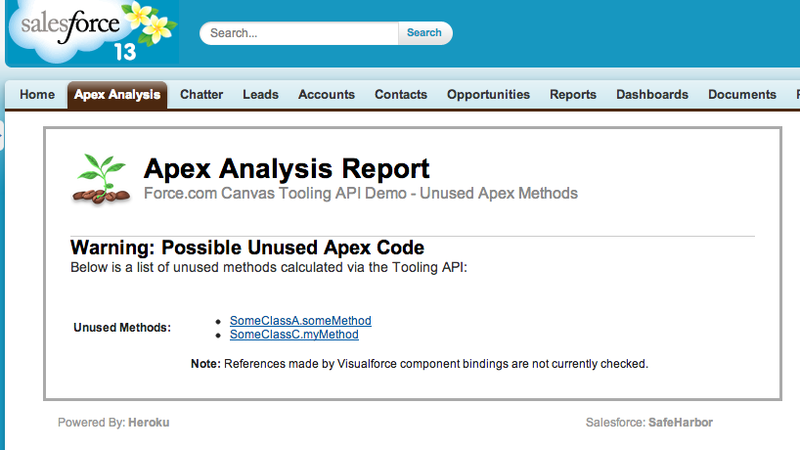 Categories: Apex, Canvas, Dreamforce, Force.com, Heroku, Tooling API | Permalink. I love API’s! How do I know I really love an API? When I sit down on an evening and the next thing I know the birds start singing, thats how! So when Salesforce first announced the Tooling API I’ve been following it closely and I am really pleased with the first version and what I’ve been able to achieve thus far with it. In the Spring’13 release it will be GA! Unsurprisingly like the Metadata API it provides CRUD (Create, Cread, Update and Delete) access to some of the key component types such as ApexClass, ApexTrigger and ApexPage. This list will grow in time. So whats the big deal you say? Well…. The real magic is what this API brings in terms of the tasks and information around authoring and executing Apex and Visualforce. Such as Debug logs, Heap dumps and my personal favourite Symbol Tables! A Symbol Table breaks down the code you write and gives you a kind of analytics over your code. Listing all the properties methods defined and also references elsewhere being made. This information is useful for all kinds of analysis, such as code refactoring and code complexity such as Cyclomatic complexity. This blog presents the beginnings of a Apex Code Analysis Tool. While also showing via Force.com Canvas thats its now possible to add such a tool directly into your DE environment, no software download required! When refactoring code, its import to know what dependencies exist between your classes, methods and properties. So that you can decide on where to trim or consolidate code accordingly. I started with the requirement of wanting to know what methods are now no longer being referenced at all, and thus could be removed. This would also improve test code coverage as well. After achieving this analysis, the tool would have the data to be easily extended. Before we get into the nitty gritty, I do want to say that I do plan once Spring’13 is out and the API is fully GA. To provide the usual Canvas app install link to make it a little easier for those of you that just want to try it out directly and not have to worry about compiling and deploying it, watch “this” space! The code is written in Java and is essentially invoked via a JSP binding on the page shown above to list the methods. The tool itself uses the Force.com Canvas SDK running on Heroku to host the logic. The Canvas SDK provides access to the oAuth token to authenticate the Tooling API calls. The Canvas Developers Guide is an excellent place to learning more about this. The SDK itself is quite light and easy to use, only a few Java classes are needed, good job guys! The next thing I needed, as Java is type safe language, was to download the Tooling API WSDL (there is also a REST interface for the Tooling API). This can be downloaded via [Your Name] > Setup > Develop > API. As this is Canvas app from the SDK, it uses Maven to build the code. I found WSDL2Java tool that would plugin into my pom.xml file in the form of JAX-WS xsimport. Armed with my client stubs I could access the Tooling API natively in Java. I’ve given more details on this on the github repo associated with this blog. This first part of the code shows the Canvas SDK in action providing the oAuth token (line 6) from the information Canvas POST’s to the page. We need to create the usual SessionHeader (standard Salesforce API approach for authentication) and populate it with the token. We also create our client service (line 10) to call the Tooling API on. These classes have been created earlier by integrating the Tooling API WSDL via the WSDL2Java tool via the pom.xml file. Next we need to understand a little about the Tooling API and how to get things done with it. The Tooling API Developers Guide is a good read to get you started. Its is essentially a matter using CRUD operations on a set of new SObject’s it exposes. To setup whats described as a MetadataContainer, which I suspect relates to a Workspace if your used to using the Developer Console (which is now widely known to have been using the Tooling API for a while now). ApexClass, if your familiar with the Metadata API you will know about this object. Also if you have poked around with Schema tools will also know it as a means to query the Apex classes in an org. MetadataContainer. This is in a sense a parent object to the ApexClassMember object described below and is kind of your working environment in which you add other components to. It is pretty simple to create, it just needs a unique name. ApexClassMember. Not to be confused with a ‘member’ variable of an Apex class btw! This object is associated with the MetadataContainer via the MetadataContainerId field. It must also be associated with the related ApexClass, via its ContentEntityId field. After that you simply provide it a Body of the code you want the Tooling API to deal with. In this use case I’ve read that directly from the ApexClass object. This object also exposes an important child object, the SymbolTable. But only after we have asked the Tooling API to process it. ContainerAsyncRequest. So far the above objects have helped you set out your stall in respect to the code you want the Tooling API to deal with. Records inserted into this object will actually get it to do some processing. Again those familiar with the Metadata API will see some old favourites on here field wise. The key one for this use case, is the IsCheckOnly field. Setting this to True ensures we don’t actually update anything, all we need is the calculated SymbolTable! The following code queries the ApexClass‘s we want to obtain the SymbolTable‘s for. Creates/recreates the MetadataContainer. Then creates and associates with it a number ApexClassMember’s for each of the ApexClass’s queried. After this stage we are ready for the magic! The following code creates a ContainerAysncRequest record, which has the effect of kicking off a background process in the Salesforce servers to begin to process the members of the MetadataContainer provided to it. Note that we set the CheckOnly field to True here, as we don’t want to actual update anything. In this sample code we simply ask Java to wait for this operation to complete. Next we requery the ApexClassMember‘s, requesting the SymbolTable information in the query. The code then scans through the SymbolTable information for each ApexClassMember looking for methods declared and methods referenced. Adding the resulting qualified method names in one of two Java Set’s accordingly for later processing. // Any local references to this method? There is some filtering applied to the methods processed. To filter out test methods (sadly for now at least annotations are not visible, so some assumptions are made here). Also methods marked as Global will not likely be referenced but of course are logically referenced by code outside of the org, so these methods are also skipped. Finally on occasion in my Sandbox I did get my SymbolTable populated with methods from System.Test, I’ve raised this with Salesforce. Finally its a matter of looping over the declared methods and checking if they are present in the referenced methods set. Then outputting our list of unreferenced methods back through the JSP page binding. You can view the latest version of the code above in the Github repo here. In this screenshot I’ve enhanced the above a little to provide hyper links to the classes. You can view the Apex code used to test this here. So there you have it! The possibilities are now finally open for the tools we’ve all been waiting for. As our Apex code bases grow along with the demands of our apps and our customers. I for one am looking forward to see what happens next from tools vendors with this API. Categories: Apex, Canvas, Force.com, Tooling API, Tools | Permalink.